This 18ct Gold Plated Sterling Silver necklace has a 3.5 cm bar engraved with Peace, and featuring the lotus design on the reverse hanging on an 16-18 inch extendable chain. Mantras are sacred words or phrases believed to have a positive effect on our well-being, reminding us of all that is joyful and beautiful in life. Repeat your mantra to yourself when you need some inspiration. 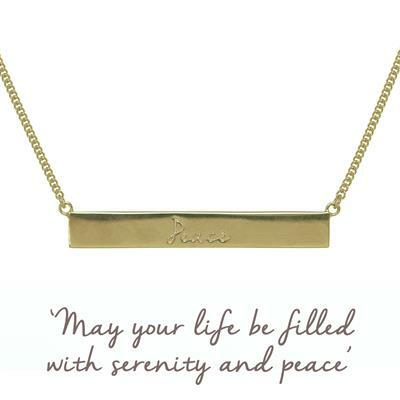 We have designed Mantra jewellery to give you a precious, personal, wearable and lasting reminder of your mantra. Wear your Mantra jewellery to bring inspiration and joy, every day. The perfect gift to support anyone going through a stressful period, or simply given as an act of kindness.